During the holiday season, most people attend tons of festive events—and nearly all of them center around fattening food. Add seasonal stress and zero time to cook or hit the gym, and you have a recipe for holiday weight gain. Well, not this year! We came up with 10 tips to help you survive the hectic holiday season. It’s inevitable that you’ll be going to at least a few soirees this holiday season, whether it’s the office holiday party or your neighbor’s annual bash. Here are a few tactics you can employ. Passed hors d'oeuvres are small but the calories add up fast. With alcohol, the goal is to keep both your calories and your buzz under control. A single shot of vodka, gin, or rum mixed with club or diet soda and a squeeze of lime will set you back only about 100 calories. Other standard low-cal options include light beer or wine, most of which have fewer than 150 calories per serving. That’s perfect if you can sip one all night; if you’re the type to make several trips to the bar (no judgments! ), try asking the bartender to fill your glass only halfway each time to keep your total intake down. Champagne or pink Prosecco are both great options. Not only are they low on the calorie chart—around 80 to 120 per glass—but they’re also more likely to be sipped rather than guzzled. If you’re planted next to the food table, you’ll shovel chips and dip into your mouth all night long. So stay far, far away. You won’t eat mindlessly if you have to cross the room to get to the food or if you’re chatting someone up. You should also be picky. 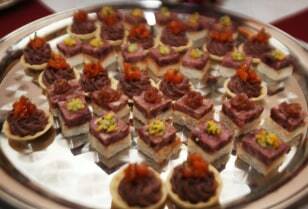 Passed hors d’oeuvres, which hover at every turn, are small, but they add up—fast. To avoid eating 2,000 calories worth of cheese puffs, limit yourself to three that you love. Been waiting all year for bacon-wrapped scallops? Go for it. But pass on the crab cakes and other fried fare. Another inevitability during the holidays is the mall food court, unless you’ve perfected the art of online shopping! Having to make decisions diminishes people’s willpower. So all the gift decisions you face at the mall will make you that much more vulnerable to temptation at the food court. Malls are filled with kiosks hawking softball-size cinnamon buns and soft pretzels on steroids. Keeping portion-controlled goodies in your bag will make other snacks easier to resist. Stick 30 pistachios or 24 almonds in a ziplock bag with two dried plums or apricots, or even some turkey jerky or a snack bar with less than 200 calories and at least 5 grams of fiber and 5 grams of protein. The carb/protein/fat combo in these foods will keep you full. An economic theory called the scarcity principle explains why we’re such suckers for holiday treats. Decades of research show that items we perceive as being in limited supply seem more desirable to us than non-scarce items. Holiday-themed coffee drinks and sweets are often more caloric than regular ones, so it’s safer to stick to the basics. Add your own cinnamon to your every day coffee or drizzle your own vanilla or peppermint extract. 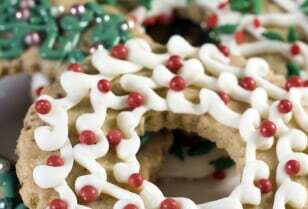 If you’re the baker in the family, you know there are many pitfalls when it comes to holiday baking. Baked goods aren’t necessarily known to be health foods, and then there are the temptations while you’re baking (cookie dough!). But don’t let that derail you. It wouldn't be the holidays without delicious treats like cookies. It wouldn’t be the holidays without delicious treats like cookies, pies, cakes and brownies. But these tasty treats can be loaded with fat. There are clever ways to cut fat, while not sacrificing taste, when you’re preparing the holiday goodies this season. In fruit pies, use half the amount of sugar the recipe calls for. You’ll save 744 calories for every cup of sugar you don’t use. In cookies and crusts, use half whole-wheat pastry flour and half all-purpose flour. Whole wheat has 12 grams of filling fiber in every cup and guests probably won’t notice the difference if you cut the all-purpose flour with whole-wheat flour. 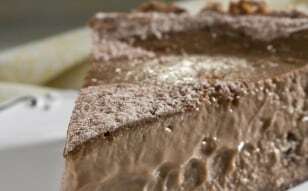 In cheesecake, substitute part-skim ricotta cheese for cream cheese. You’ll double the amount of hunger-fighting protein and cut the fat by close to 60 grams for each cup you use. In brownies, cakey cookies, and fruit breads, use pureed pumpkin instead of oil. For every half-cup of oil you sub out, you’ll save more than 900 calories and 100 grams of fat using pumpkin puree instead. Plus, pumpkin puree keeps baked goods moist. It’s easy to think that ‘tastes’ are calorie-free. But just because two spoonfuls of cookie dough fail to register emotionally doesn’t mean they don’t count. In fact, they count right up to 500 calories. To resist temptation, clean as you go. Have a pan of hot, soapy water on standby and plunge batter-covered beaters and spoons into it once you’re done with them. This protects you from nibbling and cleanup is that much easier. If all else fails, when you’re tempted by a cookie-dough-laden mixing spoon, remember this: The raw eggs in that dough may contain salmonella, a bacteria that can cause food poisoning and was the reason for the recall of more than 380 million eggs earlier this year. Once you’ve successfully navigated your way through all the parties, made it out of the mall without consuming the large gingerbread frappuccino, and baked healthy holiday treats without as much as a nibble of raw cookie dough, there’s still another pitfall. The big, sit-down holiday meal! Don’t fret, there are tactics to make it through without feeling like you’re the stuffed turkey. You don't have to deprive yourself of the cheesecake, if you pass on the roll at dinner. Also, downsize your glasses so you don’t consume too many liquid calories. It’s more difficult to exercise portion control when you’re pouring into a large glass. Instead of drinking out of pint glasses, use smaller juice glasses and stay away from oversized wine glasses. You’ll also want to consider your serving dishes. In studies, people ate as much as 56 percent more when they served themselves from a one-gallon bowl than they did from a half-gallon one. If you use smaller serving dishes that hold less food, people will be less likely to over-serve themselves. Variety may be the spice of life, but it’s the scourge of your scale. The more options there are, the more we want to try. One tactic is to offer to bring a healthy dish. Your stressed-out hostess will welcome the contribution, and you’ll have a safe go-to. You should also practice portion control. Your total amount of carbs— potatoes, cranberry sauce, stuffing—should be the size of your fist. You shouldn’t be eating as much as your uncle who used to be a linebacker in college. The same goes for lean proteins, which should be the size and thickness of your palm (no fingers). If you’re a dessert person and you know you won’t be able to pass up that piece of cheesecake, don’t deprive yourself. You’ll just find yourself at the fridge at 2am with fork in hand. Instead, pass on the roll with butter at dinner and have a small piece of cheesecake. You’ll enjoy it guilt-free and not feel like you’re missing out. Use leftovers to your advantage, so you’re not wasteful. For example, fresh turkey on spinach salad after Thanksgiving. Or, make a big turkey veggie soup. If you’re serving ham, try a protein charged ham omelet or an open-faced ham and reduced fat cheddar sandwich. © 2012 Rodale Inc. All rights reserved. Are Your Friends a Fat Influence? Get Look Better Naked & Get A Better Body in 6 Weeks!